This has been my favorite cologne for almost 10 years and I am so sad the production has been stopped. So thanks to overstock for helping me stock up on these. Invigiorate yourself with Lacoste Essential for men. Showcasing bright citrus notes over an earthy patchouli base, this eau de toilette comes in a spray bottle for an easy dash of fragrance at home or the gym. I had been looking for this Lacoste Essential Men’s Sprsy. So glad overstock had it. It smells wonderful and was a great surprise gift for my husband. He loved it. We will be ordering it again. Received it quick. If you want a great Spray to make your man smell good order Lacoste. You won’t regret it. When we went on vacation a lady asked him what he had on cause he smelled so good. Very clean citrus fragrance, always a good go to! This cologne is the best. I got it for my son for Christmas and he was very happy with it. It only takes a little bit, so this bottle will last a long time. The best scent in the line of Lacoste men's cologne. After getting a sample of this at the mall, I really liked it. I went online to look for a full sized bottle and Overstock had by far the best price. 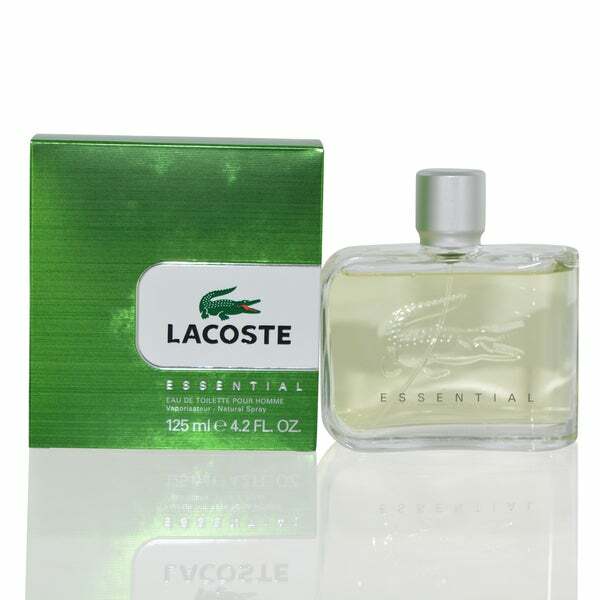 Lacoste Essential is perfect for going to lunch or something in the day with it's fresh and crisp scent. Not the best for a night out but that is just my personal preference. I wasn't sure that what would arrive at this price would be the actual Essential cologne, but it is. If you know you like this scent, I'd absolutely recommend buying this. Got a bigger bottle (the 4.2 oz size) for less than I bought the last bottle (2.5 oz) in a store. There is always a feeling of risk when buying fragrances online because of the possibility of acquiring an imitation or fake. I can say this Lactose fragrance I bought is indeed legit. It came wrapped and with a batch number. Much cheaper it here, almost $ cheaper, than buying it in store. As far as the fragrance its great for after gym or in warm weather. Very fresh and clean. Not the longest lasting fragrance by any means but it will have you smelling clean for a good while, like it for the office. product and CS was excellent. It is my son's favorite. He loved it. Smells nice and it makes me feel better about myself than spraying Axe all over myslef. Amazing value for same product sold in stores! Its been over 8 days, and the items is not yet shipped.